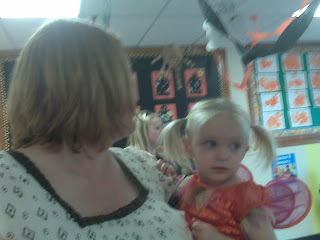 Here's some pix of Sophia at her Daycare's "Harvest Festival". I don't know what they were harvesting - my will to live perhaps? It was actually pretty fun but Sophia was coughing up a storm, which was embarrassing. "Hi! Could you just let my Daughter retch her contagion directly into your child's face? Thanks!" That and they didn't do any of it outside, so it became insanely crowded in no time. 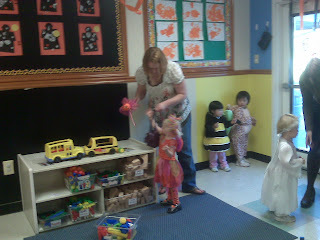 The little girl in the bee costume is "Cacky" (Catherine) who always wants to give Sophia big monster hugs that Sophia runs from in terror. It's hilarious. And the girl in the Angel costume is Clara, another old friend of Sophia's. Clara went to the two's class months ago, but for weeks after she left Sophia would get frustrated with something and scream "Clara!". Clara is where Sophia got her name for herself of "Shweewee". "Where's Shweewee?" I'll ask and she'll happily point to herself. After that we left early to go try and get some stuff for a work Halloween costume for Abbey, and Sophia promptly fell asleep in the car. We know the danger of not letting her get some sleep when she misses her nap at daycare so I stayed in the car with her for about an hour as Abbey drove from store to store and then would run in. Thank god for NPR. We Vicks Baby Rub'd her after her bath that night and put the inclined wedge back in her crib to try to help with her cough. We kicked the humidifier up a notch, and that seemed to help. 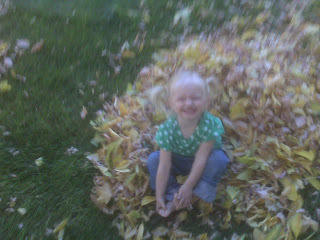 She was a chipper dancing fool when I dropped her off at day care this morning so apparently it did help. The cough remains, but no fever, less runny nose, and high spirits seem to point to her being on the mend. Go genki Sophia! Shweewee? That is awesome! She is at that age where you want to record everything they say and do because it's so cute. So record everything and post it here. It cracks me up!